It can be hard to find the inspiration to innovate, but I think a great starting place is solving a problem. Being a target player of your own game helps because you can better anticipate what other players may expect and also consider what they might need. 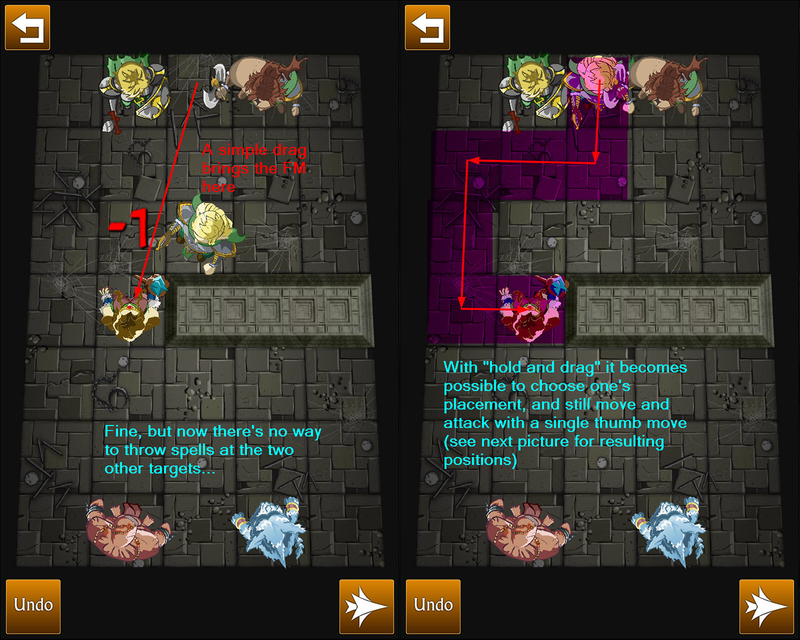 When I sought to build Summoners Fate, I was aiming to create a tactics game that works on mobile. There’s a small group of gamers out there, I reasoned, that, like myself, struggle with the level of attention demanded in deeply complex turn-based games. It’s not that we don’t love the classic mechanics, it’s that life now presents so many distractions that a period of undivided attention any longer than about 3 minutes is rare to come by. My problem begged a question: How can I condense the fun of a tactics game into a 3 minute session without diluting fun? But first - what exactly is fun about tactics games? It’s not just the thrill of winning. It’s the satisfaction of how you win the game by outmaneuvering your opponent that matters. Even when I don’t win, I typically still have fun because I learn a new surprise I hadn’t considered from my opponent. What isn’t fun? Digging through menus, reading rules, getting upset when the rules aren’t clear, trying to do something and not being able to do it, waiting for things to animate. Eliminating these barriers seemed like a logical step. My first prototype for Summoners Fate was a crude programmer mock up using assets from my first game, Hero Mages. I gutted out all of the sub menus, ability bars and buttons that were used to control characters. Instead, you’d tap a character to select them, targets would appear, and then you’d tap a target to do the appropriate action. Additionally, animations wouldn’t hold you up. You can queue up as many orders as possible for the turn and the game engine runs the animations in parallel, skipping animations if a dependency was needed. Pretty straightforward, right? But not innovative. These things took me a notch above my previous game, but they had been done before. Next I thought: “How can I condense the process further and make this even easier for the player?” Most tactics games separate movement and attacking into two separate actions. This actually creates a huge problem where it can become unclear to the player which characters have moved, which characters have attacked, and so forth (without cluttering all the character art with excessive indicators). “Why do movement and attack have to be separate actions?” I thought. Why not allow the game to calculate all of the possible actions you can take on your turn so that the player can just pick instead of having to count out where they’ll land when they move? This was the first decision that started leading to real innovation. Tapping a melee character and seeing all of the enemies in reach for its attack (move included) then executing an order with ease by tapping the enemy. Brilliant! Not quite. When I shared the new mechanic with a small group of Hero Mages players, they hated it. While they did find the new controls intuitive, they felt it took away control. Control, I learned, is essential for a satisfying tactics experience. I listened to the players and their needs. One player in particular, Antoine (aka Scribe) suggested a remedy: allow the player to control movement by drawing a path from the character to the target. This did the trick. The control was simple and intuitive, and it actually added more control than was previously possible because the player could now control the direction and facing of their character as well. The final move+attack gesture control uses bright colored arrows with different shapes and icons to denote the commands for colorblind players. I ran with the concept and continued to improve upon it. 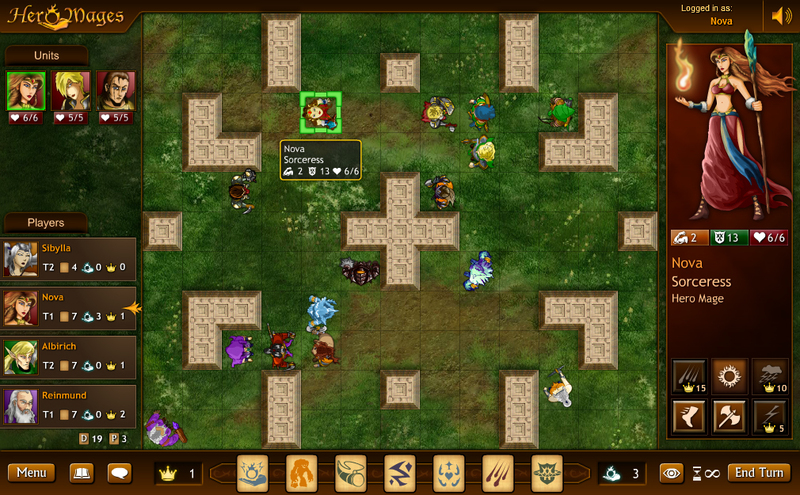 Playtesting showed that combining the movement and attack resulted in significantly faster gameplay. Part of this was due to the better controls. The other part comes from eliminating choice permutations (move then attack, or attack then move). Players were happy with the more fluid gameplay. By introducing an intuitive way to control character direction and facing, our combined move/attack gesture inspired a series of innovations that have helped us expand the tactics genre. Here are three combat mechanics you won’t find in any other tactics game (at least any we have played, and we’ve played a lot) because they are new to the genre in Summoners Fate: shield block, overkill, gravity combo. After blocking, the shield arm is staggered and lowers to the side, leaving its wielder vulnerable to subsequent attacks. Shields prevent all physical attack damage (swords, arrows, etc.) that hit the character from the front or sides. Shields have no defensive ability if the character is struck from the rear. The act of blocking with the shield staggers its user, causing their shield arm to drop and leaving them vulnerable to subsequent attacks. To use the shield again, the character must move to reposition their stance and regain their bearings. With this mechanic, you can evolve a multitude of strategies and counters, ranging from creating a “shield wall” formation to prevent enemies from reaching the vulnerable rear, to using teleport spells or magic to blast past the defense. 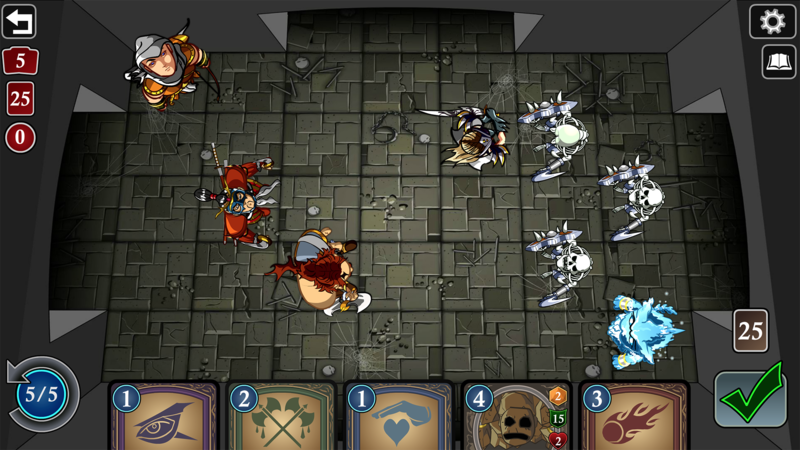 Many turn-based tactics games have a counter attack mechanic where an enemy you choose to attack will immediately attack back in response, causing both units to exchange damage. I tried this, but it was a bit funny when I pegged a giant cyclops against an itty bitty squirrel. How does a squirrel muster up the energy to attack after being splat? So, I devised a concept called “overkill” that prevents an enemy from counter attacking if the damage is greater than their remaining health. Big shark trumps little fish. I think we can all agree the squirrel is "overkilled"
Character’s remaining life after the attack is greater than or equal to 0. If the damage dealt is greater than remaining life, bringing them to a negative life total, they are “overkilled” and get no counter attack. With this mechanic, who you choose to attack and when you choose to attack them now results in vastly different outcomes, creating very diverse tactical scenarios. For example, a faster unit might sneak behind a bigger enemy to “whittle him down” enabling a unit in the front that would otherwise get killed by a counter attack to now survive and fight another day. The concept of “gravity” is often represented in games in the form of a push/knockback or a pull effect. It’s definitely satisfying to push an enemy off of a cliff, but it’s not so much fun when you push an enemy back, only to have them march up and hit you again. With our directional facing, I was able to take the concept of gravity and build a direct, meaningful use for it by combining it with our counter attack mechanics to create combo chains. Treant, Dreadnought Titan, and Barbarian engage in a game of Occuloid catch thanks to gravity combos. Occuloid is not amused. Enemies cannot counter attack gravity combos, enabling these heroes to take down the Mountain Troll without getting sledged. In playtesting, gravity has proven exceptionally fun for its tendency to inspire “game the system” moments where you try and rack up the highest combo chain possible. I’m excited to see how players use this mechanic to gain strategic advantage. While there’s always a place for the tried-and-true mechanics, considering the expectations and needs of your players is a great way to identify problems and areas for improvement. Solving a problem is a great way to find innovation and deliver something that’s fresh, exciting, and evolves a game genre forward.